It just takes one post or tweet to tarnish your business reputation. One mistake by an otherwise savvy employee or company can be labeled a social media fail, a dishonor so damaging that it’s not only fodder for the front page and late-night talk shows, but it’s a brand buster, too. Learn from these recent online offenders to help keep your company’s character in good standing. 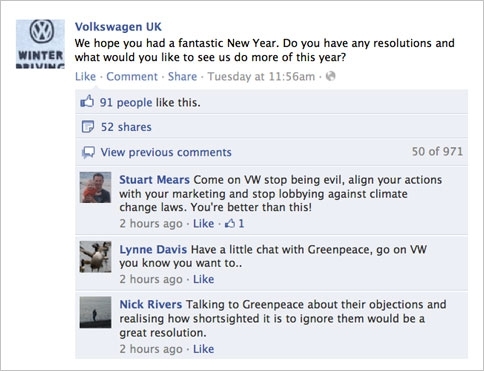 In 2012, Volkswagen wished their Facebook users a Happy New Year and asked, “…what would you like to see us do more of this year?” So Greenpeace, citing Volkswagen’s anti-climate policies, encouraged its Facebook supporters to reply to the car maker’s query. And comment they did, largely opposing Volkswagen’s lobbying efforts against the environment. Not only did Volkswagen ignore the negative posts, but they also began deleting them. The censorship so angered the Greenpeace community that it became an international story AND is still going strong. Want more social media fails? Read the rest of this article at Search Engine Journal.